UDM Downloads > ID Harddisk SmartChecker! ID Harddisk SmartChecker is a utility program designed to maintain the efficient functioning of your computer's system. It uses the S.M.A.R.T. technology to check the status of your disk, detecting and preventing problems from occurring and inflicting damage in any way. Main Features: - Checks computer status - Smartly monitors over your PC - Offers S.M.A.R.T. disk technology support - Alerts to changes in the status of your disk - Shuts down your PC in case of overheating Detailed features: - Check the status of your computer, by using the advanced S.M.A.R.T technology. ID Harddisk SmartChecker detects any possible problems that may appear to prohibit in your system's efficient functioning. - Monitors over your computer, supervising each action and making sure none of them are threatening in any way and that each application runs at their highest parameters. - Alerts you whenever a change is being made in the status of your disk. It so keeps you informed of all the actions accomplished and also prevents unauthorized modifications from taking place. - ID Harddisk SmartChecker monitors the temperature in the hard drive, preventing overheating from affecting your system. It lets you know when the temperature is too high and dangerous. 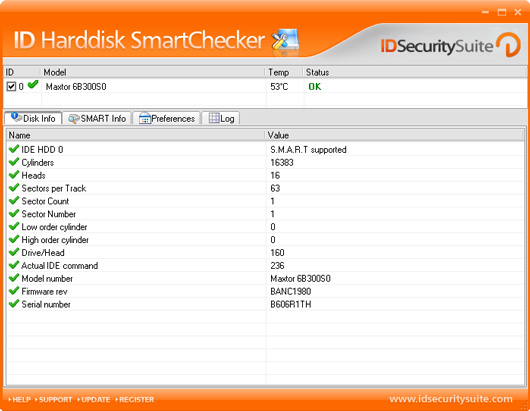 - Allows you to set overheating options, to make ID Harddisk SmartChecker an active tool. In case of dangerous overheating, you can enable it to automatically shutdown your computer for cooling down, saving and securing all of your files before doing this action. - Notifies you regarding a variety of actions taking place in your computer's system. Setting your personal preferences, you can have it alert you every time you receive mail, by a different sound alert.- ID Harddisk SmartChecker has a simple, convenient graphic interface which is very easy to use. It smartly checks your disk quickly and efficiently and requires minimum space on your disk to operate.